Ken Block CLIMBKHANA With 1400 HP Methanol-Fed Twin Turbo Hoonicorn V2 Mustang! - Muscle Cars Zone! 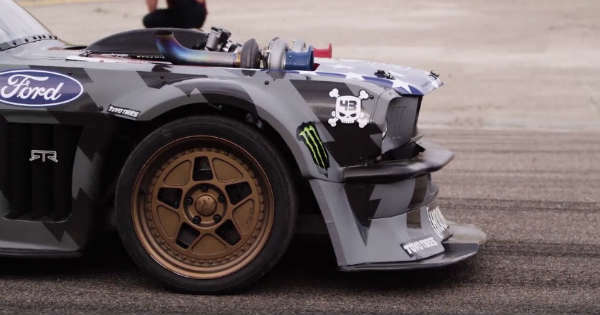 Ken Block CLIMBKHANA With 1400 HP Methanol-Fed Twin Turbo Hoonicorn V2 Mustang! Enjoy this amazing video with Ken Block CLIMBKHANA with his 1400 HP Methanol-Fed Twin Turbo Hoonicorn V2 Mustang! What`s it like to drive this beast? Even Ken Block says it is terrifying and it took a lot of time for him to admit that! In the video below you can see his reaction from the first testing of this beast, together with an amazing testing footage. The iconic Hoonicorn Mustang with all-wheel drive went trough some drastic changes over the last several months. We are pretty sure you remember that the car had 850 horsepower and a naturally aspirated engine under the hood. Now, this beast is build with two Garrett turbos taking this beast to another level with 1,400 horsepower. Even Ken Block admits that the car is totally different comparing to anything he has driven before. This amazing unique hotrod is already braking the internet from his unveiling and we can not wait to see it slaying tires on the incredible Pike`s Peak hillclimb in Colorado. Sound like you need to turn on your speakers and watch this newly released video. Please share your opinion about the new 1400 HP Methanol-Fed Twin Turbo Hoonicorn V2 Mustang in the comment section below and share this post with your friends on Facebook. What’s it like to drive the 1400 horsepower methanol-fed twin turbo Hoonicorn V2? Terrifying. And it takes a LOT for me to admit that! Ha. Check out my reaction to testing this beast for the first time ever, along with some great testing footage, in the video below.